Hydrates and Purifies with Anti-Inflammatory properties for overall restoration of the skin. A pure, high quality formula that has proven beneficial for even the most sensitive skin types. The Universal Serum is specifically formulated to isolate the short chain Hyaluronic Acid (HA) molecules in order to achieve an increased protection from oxidative stress and external factors. During the beginning of the process where various chain structures are found within the molecule, enzymes are used to split the chain in order to extract an intense short chain molecule. Our serum is specifically formulated for ageing, acneic and sensitive skin. Research has found that long chain HA is more beneficial for night time or permanent lines as it leaves an additional layer on the skin’s surface which provides a silkier feel, however is found to trap micro pearls of water which can increase the impact of the sun. 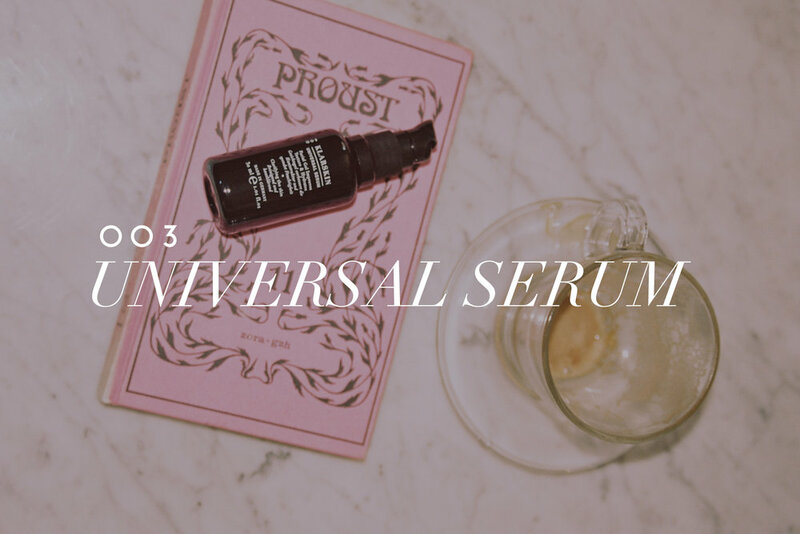 The Universal Serum is therefore absorbed more effectively and leaves no residue on skin’s surface. The HA molecule works on the surface to hold moisture, leaving you with a healthy, hydrated look and feel. This is why its 003 in the Process – leaving the Radiance Powder and Reforming Liquid to replenish your body, ultimately providing skin the internal tools it requires to enhance at its optimum. The Serum was formulated with the aim to hydrate but not dry out oil, meaning no clogged pores or shine, just an even and hydrated tone. This means skin no longer needs to produce excessive sebum. The use of HA along with Silver and Zinc means the skin's natural moisture balance remains intact, sebum production is regulated as the ingredients are not drying you out, leaving the silver and zinc to work effectively in a ´calm skin eco-system´ kind of environment. Silver, apart from the protective and anti-inflammatory effects working to eliminate acne, firm skin, heal infections and strengthen the immune system - It’s a luxurious ingredient when used correctly. You´ve only got one epidermis after all. Finally Zinc assists with the `clean but not dried out` effect – a soothing agent tackling inflammation, the top layer of your skin is concentrated with up to 6 times more of the zinc mineral than the lower levels (yes zinc is found in every cell of your body). Healing, rejuvenating and calming effects means it was the final piece in the perfect every day serum puzzle.